While developing excellence in knowledge and skills, academic institutions have often overlooked their obligation to instill wellbeing. To address this, we introduced a 14-week positive psychology intervention (PPI) program (Happiness 101) to university students from 39 different nations studying in the United Arab Emirates (N = 159). Students were exposed to 18 different PPIs. Pre, post, and 3-month-post measures were taken assessing hedonic and eudaimonic well-being, and beliefs regarding the fear and fragility of happiness. At the end of the semester, relative to a control group (N = 108), participants exposed to the Happiness 101 program reported higher levels of both hedonic and eudaimonic well-being, and lower levels of fear of happiness and the belief that happiness is fragile. Boosts in life satisfaction and net-positive affect, and reduction of fear of happiness and the belief that happiness is fragile were maintained in the Happiness 101 group 3 months post-intervention. Gander, F., Proyer, R. T., & Ruch, W. (2016). Positive psychology interventions addressing pleasure, engagement, meaning, positive relationships, and accomplishment increase well-being and ameliorate depressive symptoms: A randomized, placebo-controlled online study. Frontiers in Psychology, 7, Article 686. https://doi.org/10.3389/fpsyg.2016.00686. Goudie, R., Mukherjee, S., De Neve, J.-E., Oswald, A. J., & Wu, S. (2012). Happiness as a driver of risk-avoiding behavior. The Centre for Economic Performance, Discussion Paper No. 1126. Retrieved March 17, 2014, from http://cep.lse.ac.uk/pubs/download/dp1126.pdf. Joshanloo, M. (2016). Self-esteem in Iran: Views from antiquity to modern times. Middle East Journal of Positive Psychology, 2(1), 22–41. Retrieved from https://middleeastjournalofpositivepsychology.org/index.php/mejpp/article/view/45. Keyes, C. L. M. (2009). Atlanta: Brief description of the Mental Health Continuum Short Form (MHC-SF). Retrieved from http://www.sociology.emory.edu/ckeyes/. Lambert, L. (2016). A new year, a new you: 52 strategies for a happier life! CreateSpace Independent Publishing: Amazon Publishing. Retrieved from https://www.amazon.com/New-Year-You-Strategies-Happier/dp/1543062326. Lambert D’raven, L., & Pasha-Zaidi, N. (2014a). Positive psychology interventions: A review for counselling practitioners. Canadian Journal of Counselling and Psychotherapy/Revue Canadienne de Counseling et de Psychothérapie, 48(4), 383–408. Retrieved from http://cjc-rcc.ucalgary.ca/cjc/index.php/rcc/article/view/2720. Lambert D’raven, L., & Pasha-Zaidi, N. (2014b). Happiness strategies among Arab university students in the United Arab Emirates. The Journal of Happiness and Well-Being, 2(1), 1–15. Retrieved from http://www.journalofhappiness.net/volume/volume-2-issue-1. Lambert, L., Pasha-Zaidi, N., Passmore, H.-A., & York Al-Karam, C. (2015). Developing an indigenous positive psychology in the United Arab Emirates. Middle East Journal of Positive Psychology, 1(1), 1–23. Retrieved from https://middleeastjournalofpositivepsychology.org/index.php/mejpp/article/view/24. Neault, R. A. (2002). Thriving in the new millennium: Career management in the changing world of work. Canadian Journal of Career Development, 1(1), 11–21. Retrieved from http://cjcdonline.ca/wp-content/uploads/2014/11/Thriving-in-the-New-Millennium.pdf. Parveen, S., Sandilya, G., & Shafiq, M. (2014). Religiosity and mental health among Muslim youth. Indian Journal of Health & Wellbeing, 5(3), 316. Retrieved from https://www.myresearchjournals.com/index.php/IJHW/article/view/507. Priller, E., & Schupp, J. (2011). Social and economic characteristics of financial and blood donors in Germany. DIW Economic Bulletin, 6, 23–30. Retrieved from http://hdl.handle.net/10419/57691. Rao, M. A., Donaldson, S. I., & Doiron, K. M. (2015). Positive psychology research in the Middle East and North Africa. Middle East Journal of Positive Psychology, 1(1), 60–76. Retrieved from https://middleeastjournalofpositivepsychology.org/index.php/mejpp/article/view/33. Tajdin, M. (2015). 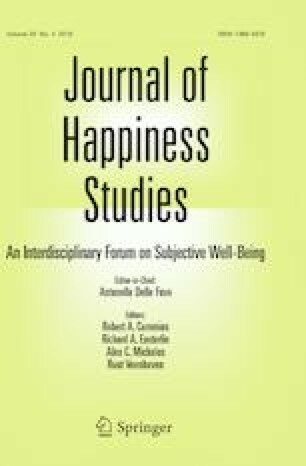 مفهوم السعادة في الفكر الإسلامي الوسيط: من الفلسفة إلى الدين (The concept of happiness in medieval Islamic thought: From philosophy to religion). Middle East Journal of Positive Psychology, 1(1), 36–44. Retrieved from https://middleeastjournalofpositivepsychology.org/index.php/mejpp/article/view/28. Thomas, J., Mutawa, M., Furber, S. W., & Grey, I. (2016). Religiosity: Reducing depressive symptoms amongst Muslim females in the United Arab Emirates. Middle East Journal of Positive Psychology, 2(1), 9–21. Retrieved from https://middleeastjournalofpositivepsychology.org/index.php/mejpp/article/view/41.